--San Giovanni in Fiore is a small medieval town was founded in the XIII century around the Florens Abbey which was built by Joachim of Flora (Gioacchino da Fiore). 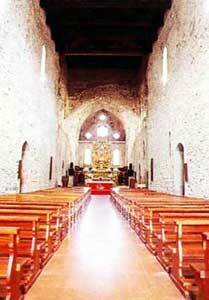 --San Giovanni in Fiore was founded in the XIII century around the Florens Abbey which was built by Gioacchino da Fiore, a medieval mystic and Cistercian monk, who wrote a lot of books about the prophecy of the salvation of the human race; for which he was very renowend even that time. Dante in the Divine Comedy decribed him as one "endowend whith prophetic spirit". --Joachim now retired to the hermitage of Pietralata, and finally founded the Abbey of Fiore (or Flora) among the Calabrian mountains, which became the center of a new and stricter branch of the Cistercian Order approved by Celestine III in 1198.